Our Potato Au Gratin is comfort food at its best. Tender potatoes, layered with onions and cheese sauce - this cheesy potato casserole will be your new favourite side dish. Melt butter in medium saucepan on medium heat. Add flour and mustard, cook and stir constantly for 1 min. Gradually add milk, stirring until well blended; cook 3 to 5 min. until thickened, stirring constantly. Add 1 cup of cheese, stir until melted. 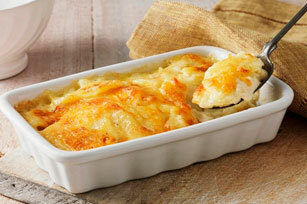 Layer potatoes, onions and cheese sauce alternately in 2-L casserole dish sprayed with cooking spray, ending with sauce. Top with remaining shredded cheese. Cover. Bake 1-1/2 hours or until potatoes are tender and top is golden brown, uncovering for the last 15 min.